Now that we have news to positively correlate with Barry’s DreamBot appearances, we can look back on the historical data and say, “Oh my gosh…DreamBot definitely saw this one for sure!” So with that, let’s get started. Sep 25: “Barry” skyrockets from near zero for the first time (this would be 19 days ahead of big news). Also notice how this surge is higher than the previous spike. The closer we get to the news, the bigger the impulse or consciousness wave, perhaps? Note that I suspect Barry Soetoro for the eventual news, and that was obviously incorrect, but how ironic that the eventual Barry would be in the same CITY as the aforementioned (i.e., Washington DC)? Is this big news? Oh indeed. Uniformed police officers and plainclothes detectives swarmed the Georgetown home of Rabbi Barry Freundel, the senior rabbi at Washington, DC’s Kesher Israel synagogue, this morning. Freundel was reportedly taken away in handcuffs by the Metropolitan Police, who also took computers and other items from the residence. Treasury Secretary Jack Lew and former senator Joe Lieberman are among the many influential members of the Kesher Israel congregation, which Freundel has headed since 1989. A police report, obtained by local D.C. news channel Fox 5, alleges that Freundel was seen installing a camera hidden in a clock radio above a shower at the mikvah. Freundel allegedly told the person who caught him that he was fixing the shower ventilation. in a typical set-up, worshippers will enter a prep room, perhaps containing toothpaste, q-tips, and a shower, before the mikveh. The idea is to be naked and rinse one’s body of all dirt so that nothing comes in between the person and the mikveh. The person is then led into the mikveh room by a person from the temple. As can be seen by the three colored lines, they all seem to be doing their own thing (i.e. random) prior to Oct 5th. However, right on the 5th, all three spike to their respective (up to that point) all-time highs. On this day, we are exactly 9 days from the arrest. Then after the synchronous triple spike on the 5th, “Embarrassing” falls back to zero and “Temple” seems to be joined at the hip (i.e., positively correlated) with “Barry” from then on. In fact, the two lines almost look close to overlapping one another. It’s rather uncanny. Therefore, we see total disharmony in the lines prior to the 5th and then suddenly “Barry” and “Temple” act as if they are they the same word! Note: Actual correlation and covariance data is purposefully withheld. Apparently, a sudden engagement of two or more words (i.e., a tight correlation) can signal significant events to come. Timing: In this instance, the news event appears exactly 9 days after the three completely unrelated words become correlated. 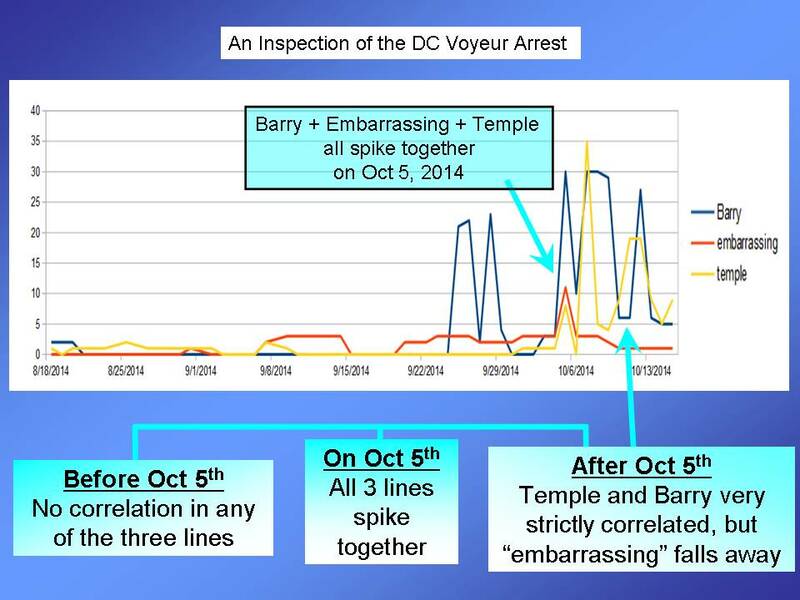 If we could have identified these graphs before hand, we could have predicted Barry would be associated with a Temple of some sort, whether that would be the college Temple, a city of that name, or some religious institution. I doubt we could have been very confident with the word “Embarrassing,” since that word falls back to zero while the others continue to dance. But that’s where the DreamBot4 phrases come in. b. Step back to the first day of correlation and analyze the DreamBot4 phrasings. c. Call in P1 dreamers to incubate further details. How easier could it be? Whoever agrees with my word “easier” can go ahead and develop my correlation warning algorithm for me! Random words might become correlated in advance of the big news event. This breakthrough stands right next to the Dallas meme as far as importance in our ultimate mission here. So now it’s back to meeting time with the big brains once again. Although this is incredibly exciting, who’s got the time to piece all this together?! I at first thought that we would be told Barry S. was really a Jew or had converted. Good one Chris! I spoke with you a while back. I had the hit in the Himalaya quake. I had something come in the past couple days. I had mentioned something big coming this dec . It came to me wondering about my mom’s health. it still may be that, but I got something in the past couple days. It has the feeling like those things that did come to fruition. It is a titanic storm of unseen size coming somewhere around the end of December or early to mid January. I cannot peg where it is…however, if it is the northern hemisphere.. my feelings say it will hit the west coast but no as bad in so cal and make it’s way east-south-east. and effect Europe. However envisioning this I do not see water… thus the clouds I am seeing could also be volcanic ash. When I envision the southern hemisphere….I get lots of water and wet in the Philippines, Indonesia and Taiwan. They are wet anyways so I can only assume that this will be above average of water. In addition, a dream I submitted a couple years ago may come to play if more diseases come. I had seen a shortage in fast food and other public food sales as there were limited things for sale. A disease already hit the swine and caused shortages in bacon and it is known that Ebola is very infectious to swine as when animals in Africa are found dead from ebola, it is over 50% of the time wild boar. if our farms get affected. the food shortage will happen.